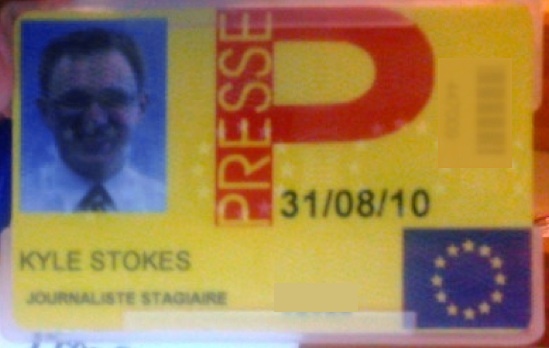 My European Commission press pass! I have so many “We’re-not-in-Kansas-anymore-Toto” moments these days that they have started to seem commonplace. They’re not culture-shock moments — they’re moments where I realize how cool the mess I’ve gotten myself into really is. Take this morning. 9:15 a.m. I’m strolling into Thomson Reuters and pass by the front desk. It’s my third day on the job as an intern there. “Good morning,” I say to the receptionist at the front desk. The World Bank. No joke. Only a press guy, but that’s okay. The World Bank? Seriously, calling for me? Welcome to my world these days. Three hours later, I’m shoving a camera in the face of a protester dressed as the World Bank’s president outside the bank’s Brussels office, his hands painted jet-black. Now, I don’t want to overblow it. It was a quirky protest, Reuters didn’t even pick up the story because it wasn’t big enough of a demonstration. Three days ago, my first day at Reuters, I was running around Brussels, getting my picture taken in EU buildings. For a European Commission press pass. I have it now — it says “Intern Journalist” on it, in French. Yesterday, I opened my e-mail. I found a message from my editor saying I’m going to Luxembourg in two weeks to help cover a summit of EU finance ministers. Next month, I’ll be in town for a massive, massive Council meeting. And if Greece falls into the Aegean Sea, I’ll be in the EU capital for the aftermath. It’s a fascinating time to be in Brussels, working for a press agency. Worry not. For all these cool opportunities, I’m not letting my head get too big, especially this early on in the game. I mean, I spilled my drink on my editor when she took me and Tyler (fellow Reuters intern, gentleman, scholar…) out after work on Wednesday. It wasn’t a lot, but such a fumble tends to humble a low-level lackey really quickly. My boss is teaching me quickly, with the utmost grace and professionalism, that I’ve got a lot still to learn. She’s a great person, and she’s great to work with — as is the other on-staff producer. I haven’t got a chance to meet the staff photogs yet — they’re ll off on assignment or on vacation after long assignments (in Cannes, and pre-World Cup). More than I’m excited about what’s happened, I’m excited for what’s ahead. I know what I sound like: You’re excited that some press guy in the Brussels office of the World Bank called you back? You’re excited for having covered a demonstration attended by almost as many press people as protesters? Seriously? I’ll try and save up my “legitimate-starstruck” moments for the summits in June — there should be plenty for a political nut like me. This weekend, I’m headed to Amsterdam! Should be a great time. Pictures from there, and from my first two weeks in Brussels, on the flipside. Cheers. So happy for you Kyle! It is a big deal! I realized it says Mom! It is Gayl, oops! It is super that you are enthusiastic about this; who wouldn’t be? Awesome.